From the skilful combination between a bread production that is inspired by the best traditional craftsmanship and the exclusive use of the Khorasan Kamut® grain, ancient and noble cereal, they become Piavettini Khorasan Kamut® biological grain. Only organically grown and non-OGM, the Khorasan Kamut® grain has an important nutritional value, a significant content of precious minerals – it’s rich in selenium – and a good protein content. The Khorasan Kamut® grain can represent an excellent alternative to wheat, also for the majority of people who are hypersensitive to this cereal. 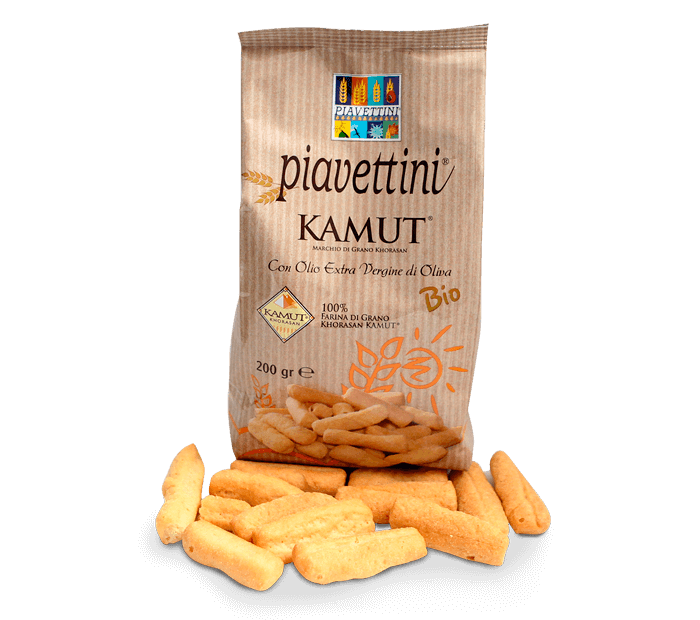 Piavettini Khorasan Kamut® grain, are processed after a slow rising of the dough (long yeast). Enriched by the precious extra virgin olive oil 100% Italian quality, Piavettini Khorasan Kamut® grain, with golden color, surprise for their taste, sweet and unmistakable, the scent of vanilla. 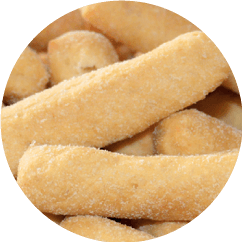 The biological Piavettini with Khorasan Kamut® wheat flour, so naturally good and fragrant, accompanying with taste every sweet or salty food and enhance the aroma and fragrance of good homemade bread of the past. The natural sweetness of Khorasan Kamut® grain is enhanced by fruit jams, but also by medium-aged cheeses. Taste: Sweet, influenced by extra virgin olive oil. Appearance: typical round of the ironing of the dough. KAMUT® khorasan * flour, extra virgin olive oil* ( 12 % ), non-hydrogenated vegetable grease* “PRESAL® iodized salt”, rice syrup*, yeast cream, dust with caster kamut*( 0.4 % ).